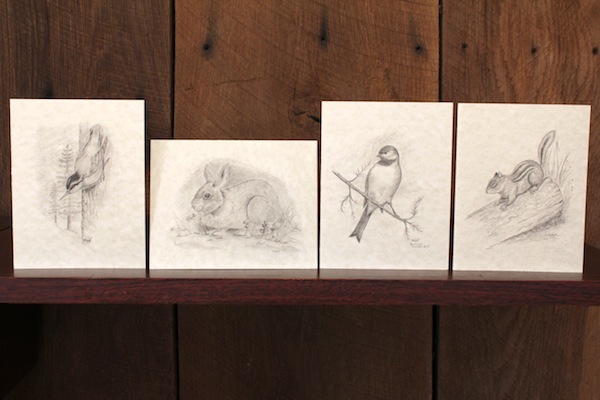 ​these beautifully detailed sketches of Tennessee’s natural wildlife, drawn by Vicki West. Chickadee, Nuthatch, Chipmunk, and Rabbit. These cards are blank inside so you can use them for any occasion and they come packaged in cellophane with Kraft envelopes. 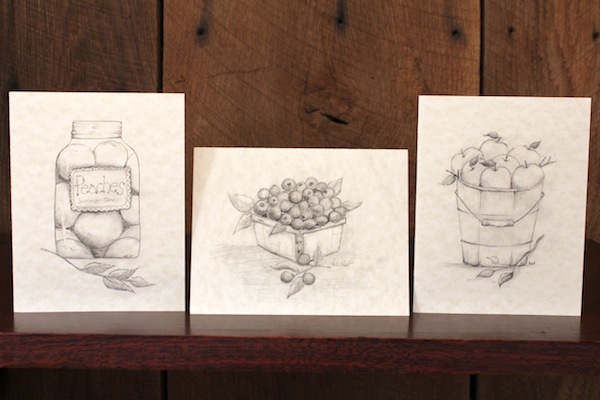 Three detailed sketches of fruit from the orchard and berry patch drawn by Vicki West. 4 3/8 x 5 3/4 soft parchment cardstock. The cards are blank inside so you can use them for any occasion, come with envelopes, and make lovely gifts. These cards are really fun to color with colored pencils. A package contains two cards of each sketch; six cards in total. Brand new sketches from the homestead kitchen drawn by Vicki West. Detailed sketches of a honey jar, live growing potted herbs, and preparation for cooking with herbs are printed on 4 3/8 x 5 3/4 soft parchment cardstock. The cards are blank inside so you can use them for any occasion, they come with envelopes, and make lovely gifts. A package contains two cards of each sketch; six cards in total. More beautifully detailed sketches of natural wildlife drawn by Vicki West. Sketches of a Chickadee, a Nuthatch, and a Junco are printed on 4 3/8 x 5 3/4 soft parchment cardstock. The cards are blank inside so you can use them for any occasion, they come with envelopes, and make lovely gifts. A package contains two cards of each sketch; six cards in total. These hand-sketched note cards, with beautiful drawings of the little blessings of the homesteading life by Vicki West, will surely bring a smile to anyone's face who may receive one! These drawings appear in the Homestead Blessing Cookbook and are inspired from real stories and memories of the farm where we were raised. Baking Cookies, Collecting Eggs, Oil Lamp, and Washing Dishes. These cards are blank inside so you can use them for any occasion and they come with envelopes. They make wonderful little gifts. 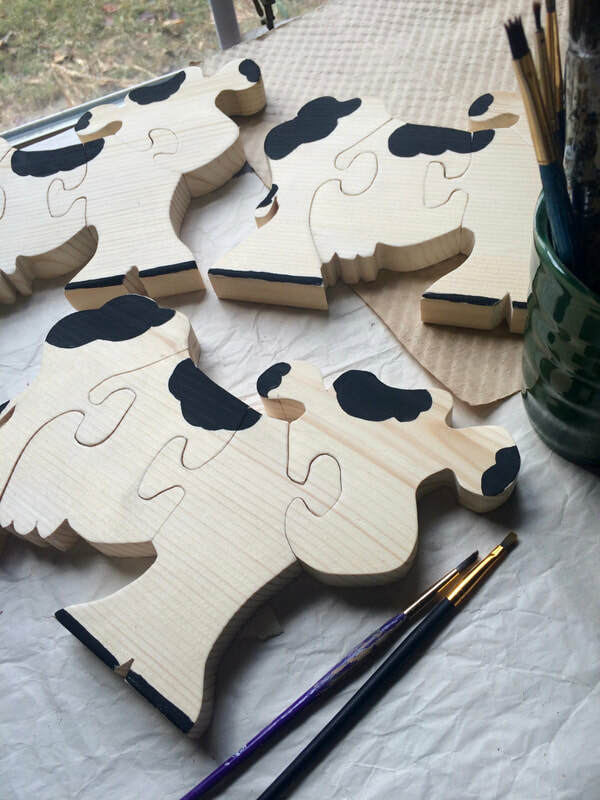 Mom crafted these wooden puzzles with the help of a dear friend who cut shapes for us one at a time with a scroll saw. 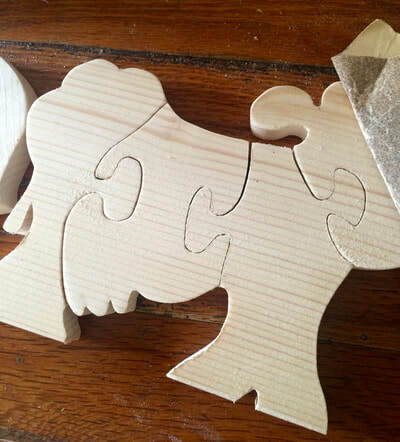 The puzzles are made of natural spruce and pine wood. Each piece of the puzzle was sanded lightly. A bit of non-toxic, water based paint was added to make a few spots on the cow and to give the chick a nice yellow . 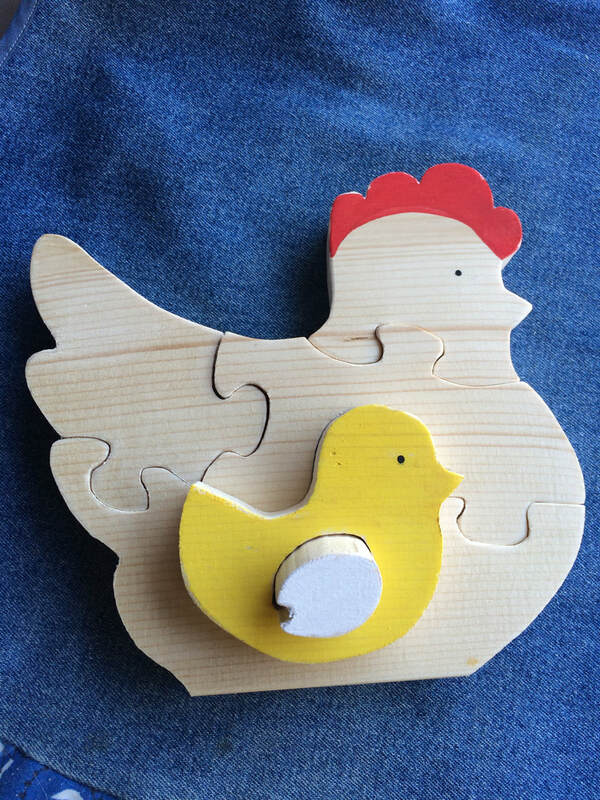 These simple puzzles are made with just a few pieces, to allow children to develop fine motor skills through the manipulation of the wood pieces. Each set is made with loving hands and is beautifully unique. ​This is a seasonal item and will only be available at certain times.